Whitener Snacks researched all the options and decided to go with CyberLock. They purchased their first CyberLocks in January, 2005, and quickly installed them on the machines that were experiencing the severest shortages. Today, CyberLocks are installed on a large percentage of the route machines. For added security, Whitener Snacks has a CyberLock cylinder in a deadbolt on the door to the Money Room and a number of CyberLock padlocks on the warehouse. Each route driver carries only one key that is programmed to enter machines on their route. The system limits each driver’s access to specific machines at given times. The audit trail from the locks and keys is very important to them. Not only are they able to monitor who is getting into their machines, and when, but it lets them know who has attempted to open a machine without authorization. “We are pleased with the system, and recommend CyberLock for companies that are experiencing the problems we were having,” says Guste. 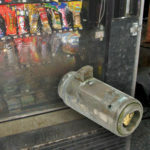 "We were amazed to find that CyberLocks on the vending machines that had been submerged in mud and water were still working."